These days, if you happen to see people standing in the middle of the street in Galata, Karaköy, Moda or Yeldeğirmeni and taking photos on their phones, chances are you’ll glance up and find street art as the subject of these images. Although there are those who claim that the history of street art – which incorporates a variety of creative techniques such as graffiti, stencils, stickers, posters, mosaics, installations, sculptures and murals – is as old as ancient man’s cave drawings, there are still critics who debate whether this practice is even legal, let alone a legitimate art form. As the discussion rolls on, however, Turkey’s first street art festival Mural Istanbul has been teaming up with the Kadıköy Municipality since 2012 to transform some of the neighborhood’s dull and dilapidated façades into giant canvases. To date, 16 international and 7 Turkish artists have created 18 works (and counting) for Mural Istanbul. 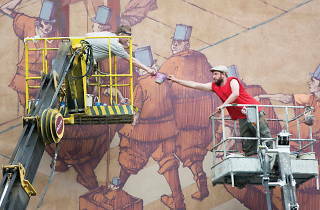 The project bore its first fruit in 2012 on Nüzhet Efendi Sokak in Kadıköy, where the unkempt walls surrounding a parking lot were brought back to life with Pixel Pancho’s “Bambino” (meaning “kid” in Italian). Shortly after completing the festival’s first work, the Italian street artist set his sights on a second wall on İzzettin Sokak – and the subsequent work, “Sultans,” quickly made a place for itself amidst Kadıköy’s memorable stray cats. In its first year, Mural Istanbul brought three works of art to Yeldeğirmeni: “Family” by Amose, who’s known for his geometric human figures; the black-and-white “Noah” by Dome; and “Balao” by Claudio Ethos, who uses a technique developed in São Paulo of lowering the pressure in the paint can to achieve a charcoal-esque effect. Buenos Aires-born mural artist Jaz aka Franco Fasoli created his mural, “One Against One,” using 100 liters of red paint in different hues, and as the largest of the artist’s works to date, it was met with great interest on leading street art websites immediately after its completion. If you happen to find yourself in Yeldeğirmeni, take a moment to plop down on a bench in the Ali İsmail Korkmaz Park on İskele Sokak and view the work sprawled on the side of an apartment building. In 2014, Common Experience (a joint project between Street Art Doping and Mural Istanbul) transformed the façades of two boring apartment buildings on Talimhane Sokak in Yeldeğirmeni with the collaborative work of Sepe and Chazme 718 as well as the solo work of M-City. As the second Mural Istanbul Street Art Festival kicked off during the Gezi Park protests in Summer 2013, many of the artists participating in the project chose to reference the Park in their works. Famous street artist INTI – whose work often features skulls, animals, people and elements from Chilean culture – not only named his mural “Resistancia” but also included the words “Memoria Resistancia” in his work. Two works created by local artists – Rad, Cins and Canavar’s “İsimsizler” and Esk Reyn, WICX, Lakormis and Fu’s “Kafa” – indicated that the collective awareness blooming circa June 2013 could also yield good results when it came to street art. Since Mural Istanbul was launched in 2012, the visibility of street art has exploded thanks to websites, applications and social media outlets such as Facebook and, particularly, Instagram. Until 2015, the festival focused on walls in the Yeldeğirmeni neighborhood, though this year’s event also takes over buildings in Moda, Kadıköy Çarşı and Hasanpaşa. 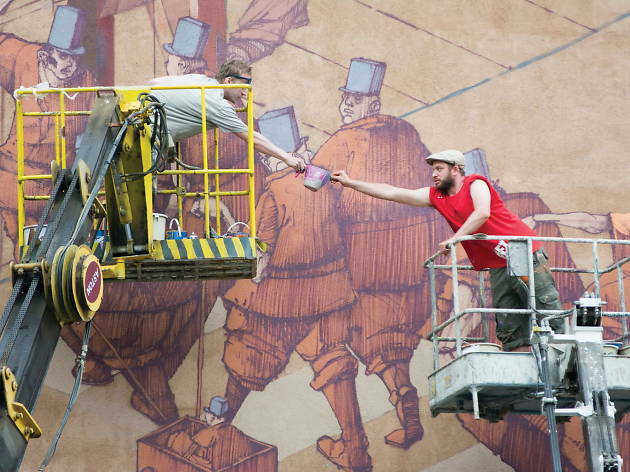 Some of the artists transforming four different streets in Kadıköy include the Tatar artist Rustam QBic, Spanish artist Deih, Americans Levi Ponce and Kristy Sandoval as well as Istanbulite Cins, who’s been decorating the city’s streets for 12 years. According to news we’ve received from the festival organizers, Marmara University’s Acıbadem Campus and the Kadıköy Municipality building in Söğütlüçeşme will get revived with their share of street art, as well. If you’d like to catch artists in action, head on over to Söğütlüçeşme from Sep 23-30 to see Wicx, Nuka and Esk Reyn on the job. For a look at past works, you can also check out the map created by Tasarım Atölyesi Kadıköy (TAK) via yeldegirmeni.kadikoy.bel.tr. We also hear that Mural Istanbul artist Nuka is getting ready to create a more comprehensive map that features walls painted this year, so stay tuned.